Principal Investigator: Dr. Mary Lu Arpaia, Botany and Plant Sciences Department, University of California – Riverside. For more project information, click here. The avocado variety germplasm block contains nearly 200 varieties that have historical significance to the development not only to the California avocado industry but to the international industry as well since many of the commercially grown varieties today originated in California. These materials are used for demonstration purposes for the public as well as seed source for the variety development program. In addition, we have a small planting of relatives of the avocado, Persea Americana, included in the collection. These materials are provided upon request to researchers within the United States and have been used in screening for resistance to exotic pests such as the Red Bay Ambrosia Beetle and its fungal symbiont, Raffaelea sp., which causes laurel wilt, as well as the Polyphagous shot hole borer (Euwallacea sp.) and its fungal symbiont, Fusarium sp. Principal Investigator: Dr. Patricia Manosalva, Plant Pathology and Microbiology Department, University of California – Riverside. For more project information, click here. California avocado growers are continuously challenged by old threats such as Phytophthora root rot (PRR) caused by Phytophthora cinnamomi (Pc) and by new emerging challenges (i.e., salinity and Polyphagous Shot Hole Borer, PSHB) that reduce grower profitability and sustainability. The goal of this proposal is establish, preserve, and maintain the avocado rootstock germplasm containing more than 150 selections including advanced rootstocks generated by the UCR Avocado Rootstock Breeding Program as well as some other material that were obtained from external sources. For over 20 years of the rootstock breeding program, the avocado rootstock germplasm collection has been maintained in South Coast Research & Extension Center (SCREC), as part of this new project we envision the repropagation and transfer of all our rootstock material to a new field at SCREC in order to properly manage and maintain our collection. Our collection comprises several selections carrying valuable traits including resistance to PRR and salinity. Some of them have been already release by UCR and available to nurseries. This project will also allow us to increase budwood source for our experimental trials, updating our breeding blocks, and providing budwood for growers and nurseries of the material available. Development of new avocado varieties through plant breeding, selection and evaluation of potential cultivars from growers and nurserymen throughout the avocado regions of the world. We are emphasizing selections for productivity, fruit quality, adaptation to California conditions, and disease and pest tolerance, tree growth habit, market acceptance and optimal maturity timing for market positioning. Improving pollination of the avocado through selection of pollenizer varieties for improved fruit set and yields through field testing and the use of genetic markers. The site at South Coast REC is the major research site for this project and supports and provides material for our statewide efforts. We re-initiated the selection process in 2000 by the planting of new isolation plots at UCR and in Ventura County. Additionally, following an external review in 2005 of the program we have expanded the maternal selection block. Renovation of this block continues and will serve as the underpinning of the program in future years. Principal Investigators: Dr. Laosheng Wu, Environmental Sciences Department, University of California - Riverside; Dr. Darren Haver, Director, UC Cooperative Extension - Orange County. For more project information, click here. Irrigation is essential to sustain agricultural production. It was estimated that over 90% of California cropland is irrigated. Irrigation water adds dissolved salts (or salinity) to cropland, thus leaching is necessary to keep the average rootzone salinity below the plant threshold EC levels in order to sustain crop production. On the other hand, nitrogen loss via leaching is a primary concern in irrigated cropland. However, the current irrigation or salinity leaching management practices do not consider how to balance the salinity and nitrate leaching, especially the optimization under drip or micro irrigation. The overall objective is to develop optimal water management practices to maximize salinity leaching with least amount of leaching water, and minimize nitrate groundwater pollution in irrigated cropland based on soil and crop characteristics, irrigation water quality and fertilization practices. To achieve the objectives, we will conduct computer simulations and field experiments to identify and verify the salinity management best management practices (BMPs) for avocado located at South Coast Research and Extension Center. Principal Investigator: Sonia Rios, Area Subtropical Horticulture Advisor, University of California Cooperative Extension Riverside. Weeds compete with avocado trees for water and nutrients, primarily during the grove's early years of growth. Weeds are usually a minor concern in healthy, mature groves that have thick mulch and a dense canopy that shades the ground. Weed competition may be a problem in nurseries and in older groves where trees have been heavily pruned or are unhealthy and have a sparse canopy, allowing more light to reach the soil surface. A dense canopy that shades the soil reduces the amount of sunlight that weeds need to grow to be competitive with the trees. Competition is strongest from perennial and summer annual weeds. If tall or dense weeds are allowed to excessively compete with young trees, the trees may start producing fruit much later than those with minimal competition. Weeds within groves, along orchard borders, and on roadsides may host or harbor pests that attack fruits or trees. Weeds on field margins can also serve as a reservoir for future weed problems, because seeds can enter the orchard with the wind or on equipment. Additionally, weedy vegetation along field margins can spread wildland fires into groves. The purpose of this research is to collect performance data to support registration of glufosinate on avocado. Principal Investigator: Dr. Tracy Kahn, Botany and Plant Sciences Department, University of California – Riverside. For more project information, click here. Preservation of citrus genetic resources, including related genera, is essential due to the loss of this genetic diversity in native habitats and the difficulty of obtaining germplasm from other countries where it is seen as a commodity that should benefit the nation in which they occur. The need for a well characterized ex-situ collection becomes more important as the potential risk of citrus diseases such as Citrus Greening Disease threaten California and other commercial citrus industries. There is evidence that certain citrus relatives may have resistance and/or tolerance to this disease and others that exist outside California. The Citrus Relatives Project at SCREC in Blocks 24 and 25 is part of the UC Citrus Variety Collection, one of the world's most diverse collections of citrus and related taxa that includes over 1000 accessions within 29 genera of the subfamily Aurantiodeae within the Rutaceae family. 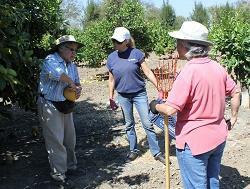 The principal location of the Citrus Variety Collection is at UC Riverside, with a supplemental planting at SREC. We are continuing efforts to preserve trees of various frost-sensitive citrus relatives at this comparatively frost-free site for research and extension activities at SCREC. This project provides a resource for distribution of seeds by the USDA National Clonal Germplasm Repository for research throughout the world and provides a resource for research in the U.S. to evaluate citrus relatives for selected reproductive and vegetative traits and tolerance and/or resistance to Citrus Greening Disease in Florida. Pitahaya, or Dragon Fruit, (Hylocereus spp. and Selenicereus megalanthus) is a vining cactus native to tropical America and commercially grown in several countries. Pitahaya is already established and grown as a backyard plant in San Diego and other counties in California for its edible fruit. The fruit is especially popular among people from Southeast Asia and Latin America for fresh consumption or for special events. However, despite the growing demand and popularity of the fruit, local supply is almost non-existent. This, combined with bans on imports of fresh pitahaya fruit into the US has created considerable interest among growers and specialty produce marketers increasing the potential for a commercial pitahaya production industry in southern California and an attractive crop alternative for local farmers. This research project aims to develop production, economic and marketing information that may lead to the commercial production of pitahaya or dragon fruit by small-scale farmers in San Diego and other counties in Southern California. Plant material from eighteen commercially grown varieties or clones of pitahaya identified as self-fruitful was used to establish a field trial to evaluate their performance under growing conditions in Southern California. 2008 was the second data collection year for the project and first for some varieties in our trial. All varieties have adapted relatively well to growing conditions in Southern California. However, there are marked differences among the varieties with regards to susceptibility to frost, sunburn, and in overall yield and fruit quality. 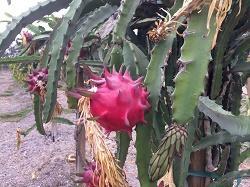 Although results are not final, the project has provided much needed information for the establishment and growth of a pitahaya industry in California. Principal Investigator: Dr. Darren Haver, Director of South Coast REC, University of California Agriculture and Natural Resources. It has been assumed for decades that most apple varieties are not adaptable or productive when grown under low chill growing conditions. This proposed trial will test that theory and attempt to prove it incorrect. Observations over the last three (3) decades have been that this assumption is totally false. Many home fruit growers in coastal southern California have been successfully growing high chill apple varieties in low chill climates. Successful research data obtained from this trial at this coastal, low chill location could open the potential for commercial, farmers market and home growers to greatly expand on the number of successful and recommended adaptable apple varieties. Principal Investigator: Dr. Darren Haver, Director, UC ANR South Coast Research and Extension Center. For more project information, click here. The purpose of this project is to provide a space for extension projects for use by the center and affliated organizations. Currently, we have blocks set aside for citrus, fig, persimmon, stone fruit, avocado, and apple trees. With the UC Cooperative Extension Master Gardeners of Orange County, we will continue to make these areas available for demonstrations, interpretive displays, and extension events. Pluots are complex interspecific hybrids of plum and apricot (Prunus sp. L. X Prunus armeniaca L.). The sugar content of a pluot fruit is reported to be much higher than either of its antecedents. These delicious new type of fruit provide new opportunities for tree fruit growers. We are evaluating 5 moderate-chill pluot cultivars on Myrobalan 29C rootstock in a trial at South Coast Research and Extension Center. A second trial evaluates the performance of Flavorich cultivar on Citation rootstock compared to Flavor Grenade cultivar on Lovell rootstock. The cultivars continue to be evaluated for adaptability, yield, fruit quality and for susceptibility to pests and diseases. Trees were planted in 2-tree plots, replicated five times in a randomized complete block design and the orchard managed following recommended cultural practices typical for plums. Specific data to be collected from the trials include tree trunk cross sectional area, fruit set, total marketable fruit number and weight, average fruit weight, fruit diameter, % TSS (total soluble solids) and panel taste scores. All data will be subjected to ANOVA and mean separation between treatments done by an appropriate test. The results of this research will be disseminated to members of the California Rare Fruit Growers Association, production nurseries and on field days and group tours of South Coast REC. Poster and oral presentations at various meetings as well as papers in professional publications will be additional avenues for extending results from this trial. Coffee ranks second only to oil as the most traded commodity in the world and is the primary agricultural export for many countries. Coffee (Coffea spp.) is native to Africa where an estimated 100 species are found in diverse geographic and climatic regions. Coffee species vary greatly depending on the region and climate where they originate, resulting in various coffee types with different genetic make-up, different morphological traits (size and shape of plants, fruits, and growing habits), flavor profiles, tolerance to pests and diseases, and tolerance to drought. Coffee plants adapt and grow well in frost-free microclimates in California from San Luis Obispo to San Diego County. Coffee plants are commonly grown as ornamentals by backyard growers and California Rare Fruit Growers, but there is no history of commercial coffee production anywhere in the continental US. Specialty coffee consumption and the demand for specialty coffees have increased dramatically in the US and the world over the past several years. This trend, combined with increased demand for high value, differentiated agricultural products (local or California grown) and declining profit margins for existing crops, has generated a strong interest in the production of specialty coffee among farmers in Southern California. However, research-based information on coffee propagation, growing, production or variety performance is needed for Southern California residents and growers interested in coffee as an ornamental plant or a commercial enterprise. This project will develop research based information and demonstrate coffee propagation techniques, evaluate 18 varieties of coffee, and assess the potential for grafted, drought tolerant coffee plants for ornamental uses or commercial production in Southern California. The use of reclaimed water (e.g., municipal treated wastewater) and biosolids in agricultural production has increased drastically in light of water scarcity as well as the increasing pressure for waste disposal. The reuse of such previously under-utilized resources has important economic and environmental benefits, but also poses potential risks to consumers due to the introduction of numerous contaminants of emerging concern (CECs) into the food products. The risks are expected to be the greatest for fresh produce, including vegetables and fruits that are consumed raw. The occurrence and levels of CECs in vegetables and fruits under field conditions are essentially unknown. CECs also encompass numerous compounds from different chemical classes, making risk analysis extremely challenging. First-hand data are urgently needed to enable human exposure estimation and development of safe practices.